Dena* is professional but fearless in advancing her clients’ interests. She has a broad trial and appellate practice, appearing before all levels of court in Ontario. She is consistently recognized by Best Lawyers for her particular expertise in Health Law. Dena is grace§ and tenacity in complex, demanding cases of all sizes across diverse industries, notably professional negligence. Dena excels under pressure‡ , and her tenacity and focus serve her clients well in court. 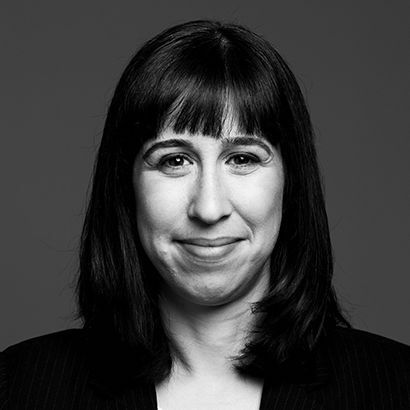 Dena is also an esteemed presenter and lecturer in education programs facilitated by the Law Society of Upper Canada and the University of Toronto. .
is a partner at Lenczner Slaght. Dena's practice has broad scope, encompassing corporate and commercial litigation, shareholder disputes and oppression claims, contract issues, professional negligence cases, class action defences, employment/wrongful dismissal matters and administrative and insurance law. She has often appeared in the Ontario Superior Court of Justice and the Ontario Court of Appeal, as well as before administrative tribunals and in private arbitrations. She clerked for the judges of the Court of Appeal before joining Lenczner Slaght. Dena has taught in continuing legal education programs presented by the Law Society of Upper Canada. She has also mentored law students at the University of Toronto and taught legal ethics at the school's bridge week. In addition, she has led courses in medical ethics for the university's Faculty of Medicine and is a co-chair at the University of Toronto Academic Tribunal. Counsel to the defendant title insurer in a successful summary judgment motion arising from the applicability of the exclusion provisions of the insurance policy. Counsel to plaintiff University in a successful trial of an action arising from fraud by senior university executives in connection with construction and maintenance work. Counsel for the defendant Molson Sport & Entertainment in a trial regarding claims of negligent misrepresentation and interference with contractual relations involving the water rights at a major concert. Xerox Corporation v Infinite Media Inc. Counsel to Xerox in a software licensing dispute encompassing allegations of copyright infringement. Counsel to the successful defendant physicians at trial in a case involving allegations of professional negligence arising from the care, treatment and management of multiple hand fractures. Counsel to the plaintiffs/appellants in an appeal regarding the deductibility of a non-pecuniary benefit under an automobile policy of insurance. Counsel to the successful appellants in an appeal concerning the limitation period for a claim against an insurer for allegedly delaying settlement of the claims of third parties against its insured and failing to pay the policy limits into an interest-bearing account to accrue for the benefit of the third parties. Counsel in an application regarding the enforcement of restrictive covenants in a commercial agreement. Counsel to appellant physician on a successful appeal to Court of Appeal from a trial judgment awarding damages to plaintiffs for medical negligence arising from a surgical procedure. Counsel to a developer in a successful dismissal of an appeal by City regarding demolition permit issued by the Ontario Municipal Board. Counsel at trial in a successful defence of a gynecologist alleged to have negligently performed the removal an ovary. Counsel for a defendant in a fraudulent conveyance action. Successfully moved to set aside an ex parte Mareva injunction. Counsel for the physician in an application for judicial review of the powers of the College of Physicians and Surgeons of Ontario to observe physicians performing medical functions and to compel an interview. Counsel to the physicians in a trial of a cross-claim between the hospital and the physicians regarding the care of a psychiatric patient. Counsel on a trial to determine the composition of the board of directors and the members of a non-profit corporation. Counsel in a trial and appeal in defence of a plastic surgeon alleged to have negligently performed reconstructive surgery. Counsel in a successful trial and appeal on behalf of the plaintiff for wrongful dismissal and payment for shareholdings and options. Counsel in application to declare the actions of a non-share capital corporation to be ultra vires the corporation's constitution. On appeal, the Court of Appeal affirmed that the actions were ultra vires. Counsel in an application for oppression by minority shareholders. Counsel in an application involving a shareholder dispute in closely held company where the applicant was seeking a just and equitable winding-up. Counsel in a successful appeal from a decision setting the membership of a non-share capital corporation on the basis that proper procedure had not be followed. Counsel in an appeal regarding the discretion of the court to restrict the ability of a trustee in bankruptcy to provide the inspectors and creditors of the bankrupt estate with access to books, records and other documents of the bankrupt. Counsel in a medical negligence trial successfully defending a physician against the allegation that he negligently prescribed Viagra to his patient. Counsel in an appeal concerning oppression remedy claims. Counsel at trial and appeal for Lombard General Insurance Company of Canada regarding the claims of equitable restitution and contribution for losses arising from a fire in a Toronto apartment building. Employers sometimes rely on severability clauses—which provide that any clauses that are found to be illegal or unenforceable are severed from the agreement and that the agreement otherwise remains in effect—to hedge against the risk that clauses in employment contracts could be found to run afoul of the Employment Standards Act and be unenforceable as a whole. However, in its recent decision in North v Metaswitch Networks Corporation, the Court of Appeal for Ontario signalled that these clauses have limited effect when parties include terms in agreements that contract out of minimum employment standards. The Supreme Court of Canada’s recent decision in Wilson v Alharayeri, may have far reaching implications for corporate director liability. The unanimous decision affirmed an award for compensation for oppression directly against two directors of a corporation by relying on the leading case on the issue, Budd v Gentra. Administrative lawyers and regulators should take note: in Swart v. College of Physicians and Surgeons of Prince Edward Island the Prince Edward Island Court of Appeal provided express guidance in the prosecution of complaints against doctors. Benchmark Canada 2019 not only recognizes Canada’s leading litigation firm with the top tier ranking of “Highly Recommended in Ontario”, 17 Lenczner Slaght litigators are also ranked for their expertise. Canada’s leading litigation firm is proud to announce that 25 of the firm’s 58 lawyers have been recognized in the Best Lawyers in Canada 2019 publication across multiple categories. Benchmark Canada has recognized six Lenczner Slaght partners as the most talented litigators under 40 and two partners recognized as two of the top female litigators in Canada. An increasing number of the firm’s lawyers have been ranked by their peers as leading practitioners in their field. 19 Lenczner Slaght leading litigators are ranked in Benchmark Litigation's 2018 directory, including 7 new additions since last year. Three of the firm's litigation stars are also recognized as a Top 50 Trial Lawyer in Canada. Almost half of the leading litigation firm’s lawyers are recognized in the Best Lawyers in Canada. Benchmark Litigation has recognized seven Lenczner Slaght partners as the most promising emerging talent in their respective fields. Lenczner Slaght’s litigators continue to be recognized by their peers as leading practitioners in their fields according to the 2017 Canadian Legal Lexpert Directory. This year, the Canadian Legal Lexpert® Directory increased the number of Lenczner Slaght lawyers ranked among the best in Canada to 23, up from 20 in 2015. Following a lengthy trial, the Ontario Superior Court of Justice has determined that former York employees played key roles in several significant frauds. Half of the firm's lawyers are ranked as leading practitioners and three named "Lawyer of the Year" in the latest Best Lawyers Directory. Canada's leading litigation practice increases to 23 partners. Following the webinar on Practical Tools to Reduce your Organization's Risk with Social Media Use which took place on October 17, 2014, Matthew Sammon, Jaan Lilles and Dena Varah were quoted in an article in the Winter issue of the CCCA Magazine which highlights the key takeaways. Nearly half of the firm's 49 lawyers are ranked as leading practitioners and two named "Lawyer of the Year" in the latest Best Lawyers Directory. Canada's leading litigation practice has 22 professionals in the 2014 Best Lawyers list. Dena Varah will be speaking at the upcoming Advocates' Society D&I Breakfast. The panel will discuss the challenges of of balancing a litigation practice and parenting commitments. Monique Jilesen, Risa Kirshblum, Shara Roy, and Dena Varah taught at Osgoode Professional Development's 39th Annual Intensive Trial Advocacy Workshop on July 8-14, 2018. Dena N. Varah spoke at the Law Society of Ontario's 2017 Civil Appeals: The Year in Review program. She took part in the "Corporate Law" panel and specifically provided her expert opinion on the decision in Wilson v. Alharayeri: Expanding Corporate Directors’ Personal Liability. Monique Jilesen, Risa Kirshblum, Jaan Lilles, and Dena Varah taught at Osgoode Professional Development's 38th Annual Intensive Trial Advocacy Workshop on July 9-15, 2017. Dena Varah and Naomi Loewith, together with Afshan Ali, Senior Counsel at CIBC Legal Department, conducted a webinar as part of the Canadian Corporate Counsel Association/ Canadian Bar Association's Webinar Series on May 14, 2015. Matthew Sammon, Jaan Lilles and Dena Varah conducted a webinar as part of the Canadian Corporate Counsel Association/Canadian Bar Association's Webinar Series on October 17, 2014 from 12:00pm to 1:30 pm. Will social media kill the non-solicitation clause? Dena Varahs article appears in the May 23, 2014 issue of the Lawyers Weekly published by LexisNexis Canada Inc.
Dena Varah presented on the topic at the Practical Tools to Reduce Your Company's Risk With Social Media seminar held on March 25, 2014. Dena Varah and Naomi Loewith joined forces to discuss cross examination of an expert and conducted a live demonstration for law students at McGill University. Dena N. Varah discusses the topic at Osgoode's 7th Annual National Forum: Administrative Law & Practice.